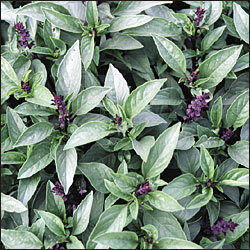 (O. basilicum) Beautiful lilac flowers with dark red stems make this basil a stand-out in your garden. 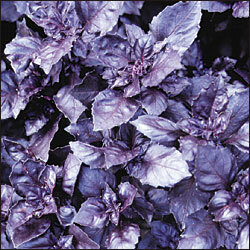 Excellent contrast with green basil, spectacular as a garnish, in salads, or for adding color to basil vinegars. Extremely uniform, all purple Italian strain. Annual. 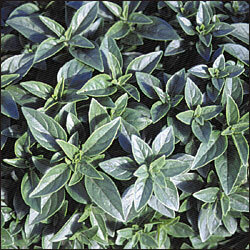 (O. basilicum) The classic large-leaved Italian sweet basil prized for its spicy flavor and wonderful aroma. Fragrant plants grow 18-24". This is the variety of choice for pesto. 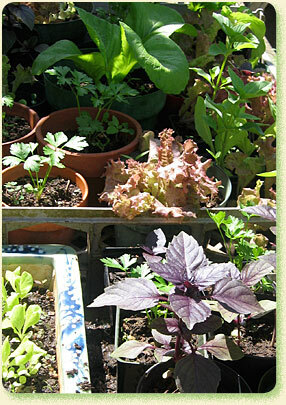 Make successive sowings for continuous summer supplies. Annual. (O. minimum) Referred to as "Greek Basil." Forms a perfect 12-18" globe bush with very small, thin leaves. 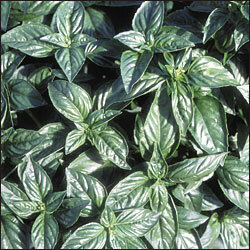 Intense sweet basil scent with spicy flavor, slow to go to seed. Ideal for pots or as borders in gardens. Extremely uniform strain. Annual. (O. basilicum) Spicy anise-clove scent and flavor. Most commonly used in Thai or Vietnamese cooking. Attractive plants are 12-18" tall with medium-green leaves. Stems and blossoms are purple, very good for pot culture. Annual. 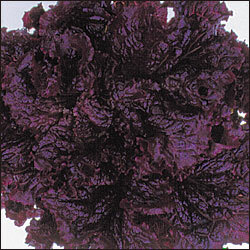 Here's a lovely dark red looseleaf lettuce. Absolutely striking appearance that continues to amaze us each season. 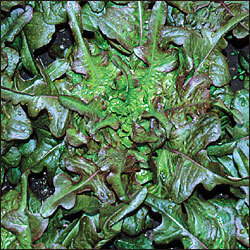 Tops of leaves are solid reddish-maroon, and the backs are green tinged with maroon. Heads are slow to bolt, 6-8" tall and 10-12" wide. Looseleaf, 55 days. Awarded the bronze medal at the 1947 All American Selections. 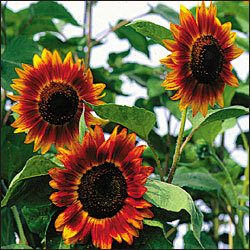 Introduced as Bronze Beauty by Germania Seed & Plant Co. 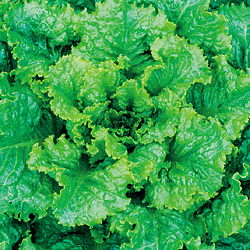 Hailed as "the finest, most colorful and most delicious leaf lettuce for the home garden." Our favorite oakleaf-type lettuce, slow to bolt. A cut-and-come-again type - harvest by cutting at the base and it will grow back! Looseleaf, 40-50 days. A long-time garden standard. 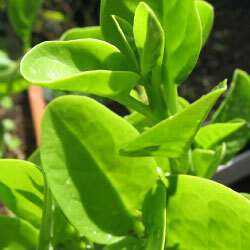 Large compact plants produce thick clusters of light green frilled leaves. Extremely slow to bolt and the taste does not turn bitter even while bolting. Developed by the USDA in 1946. Looseleaf, 45-55 days. Amish variety valued for its ruggedness and heavy production. 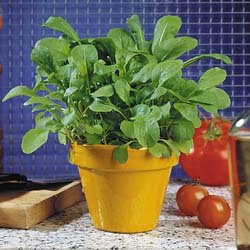 Thick compact plant great for a cut-and-come-again lettuce. Sharply triangular green leaves with straight edges. Unique growth habit. Thin midrib, good texture. Pleasant, sharp flavor. Looseleaf, 45-55 days. 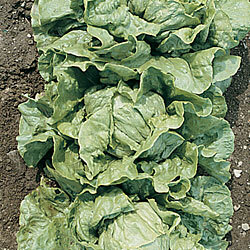 A smooth leaf variety that forms a larger head than the Manoa lettuce. Ideal under cool weather and lower elevations. Matures in 50-60 days. 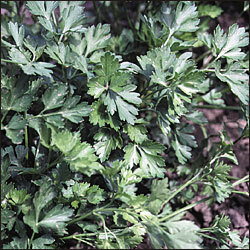 (Petroselinum crispum) Large bushy plants produce a continuous supply of large flat leaves with strong parsley flavor. Prized by Italian cooks. Grown as an annual. 85-90 days. 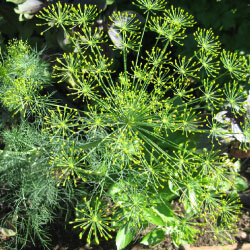 Lovely, fragrant dill. 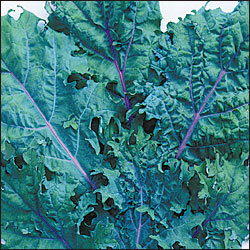 Its feathery foliage is delicious in salmon dishes, eggs, soups and salads. Like its mainland cousins, our prefers light, freely draining soil and bright summer sun. When it goes to seed, showy yellow flowers give way to masses of seeds for cooking, sharing or sowing your next garden. Self-seeding annual. A beautiful striped eggplant. Heavy yields of teardrop-shaped fruits are green with vibrant lavender stripes and striking green calyxes. Ripens to yellow. Best eaten small, when fruits are about 3" long. Great for chutneys and curries. 80-90 days from transplant. 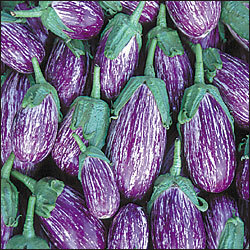 Used extensively in Thai cuisines. 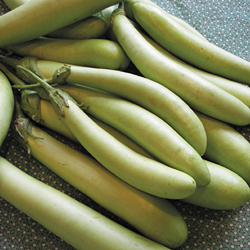 Beautiful long slender 12" fruits have tender light-green skin that does not require peeling. Tender, fine quality white flesh with mild pleasant flavor that absorbs spicy flavors well. Prolific and drought resistant. 70-80 days from transplant. 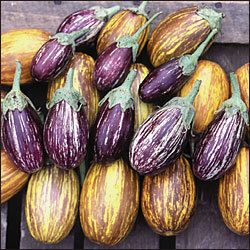 Beautiful striped Italian eggplant. An excellent strain with consistent deep color. You may have seen it at the KCC Farmers Market. Reliable, heavy yields of excellent quality 6-8" thin skinned fruits. 80-90 days from transplant. 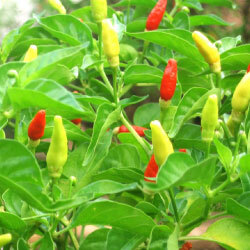 The key ingredient in those classic local condiments, chili pepper water and chili pepper jelly. Attractive bushy shrub produces loads of tiny upright peppers as festive as Christmas lights. 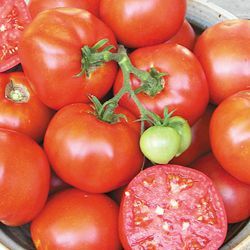 Easy to grow in our warmer, drier island neighborhoods. Prefers well-drained soil and bright sun. Drought tolerant. Not a true spinach but an excellent spinach substitute for Hawaii gardens. 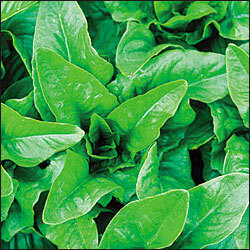 This vigorous climber can take the tropical heat that flattens standard spinach varieties. And it adds a graceful vertical element to your edible landscape plan. A refreshing addition to salads and stirfries. Easy to grow up a trellis or fence. Readily self-sows, sometimes where you'd least expect it. Highly improved Dutch strain of domesticated rocket. Very large, rounded leaves are high in vitamin C. Excellent taste and rarely bitter. Will produce 3-5 cuttings per year if kept well picked. 40-45 days. 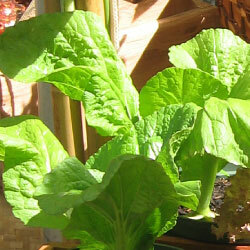 A big, showy green mustard cabbage that adds zip to your stirfries, rice dishes, soups and salads. Its flavor - rather like a mild horseradish - grows more pungent as the plant matures. Cooler temperatures and consistent moisture keep gai choy going strong. The UH Seed Lab bred this variety to resist white rust. Introduced to American gardeners in 1892 by Thorburn from seed they obtained from Japan. Vigorous growth, strong grasping tendrils, fine for trellises. Can also be grown on the ground. 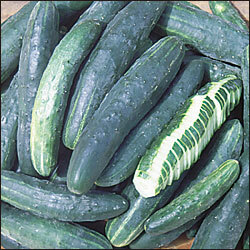 Fruits are 7-9" long by 3" in diameter, nice quality for both slicing or pickling. 58-65 days. (a.k.a. 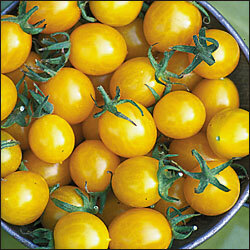 Little Blonde Girl) Small golden-yellow 1" fruits with excellent sweet taste. Fruits are borne in giant clusters. Enormous yields. Indeterminate, 75-80 days from transplant. Named for the Crimean peninsula in the Black Sea. 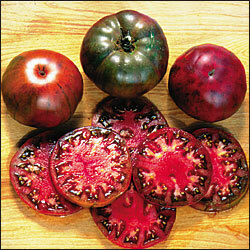 Slightly flattened 4-5" globes with dark greenish-black shoulders, turns almost black with enough heat and sun. Excellent full flavor. Indeterminate, 69-90 days from transplant. (H. annuus) Large flowers in shades of orange, red and burgundy. Extremely dark center. Multiple heads, extended bloom period, great for cutting. Plants grow 6–8' tall. 75 days. An English heirloom, also known as The Lyon. Plants are very tall, up to 36", with thick solid pure-white stalks. 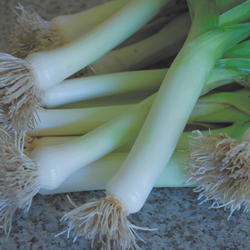 Even with its extremely large size, the stalk retains its tenderness and mild flavor. Started appearing in American catalogs at the end of the 1880s. 110-135 days from transplant. 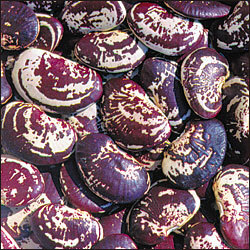 Produces beautiful large quarter-size flat white seeds with maroon spots and swirls. Used as a green shell lima or dry. Rich flavor with heavy yields. Bears even during extreme heat. Dates back to the 1840s. Pole habit, 75- 100 days. 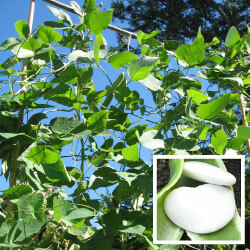 The same vigorous pole habit as Palolo Pink, but with extra-long (inedible) pods and huge white beans with a creamy texture. Absolutely beautiful in cooked bean dishes and soups. Give this little lima a fence to climb and you will get a thick green curtain of lush "beanery" in return. 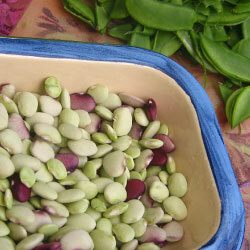 These shelling beans are greenish white at the baby stage, pink when mature. Cook them fresh with corn and butter for a tasty succotash. Or use dried beans in a hearty soup. Don't forget to save some to plant next season. Direct seeding is best, but our Palolo limas transplant nicely.